Well folks, we have finally reached the end of our Interior Design Trend 2014 series. So with all that has been covered, I thought I would put together a summary of what we have actually been seeing the most of, what has already peaked (and is starting to trend out) and what seems to be sticking around. The biggest trend for 2014 – Glamour, but not exclusively. Interweaving Mixing Metals and Innovative Combinations, we have been seeing a lot of glamorous, elegant and sleek interior spaces. While thinking about glamour and mixing metals, it would be very easy to conjure up images of old fashioned spaces that lack light and vibrance. What we’re seeing today is aspects of the old classics, but set in rooms filled with light and other sleek, modern pieces. The end result is very special, it’s classic (and doesn’t date as quickly as other trends) and finally – its modern! Past its peak – Vintage wonder. I really believe that for now, this trend has had its lime light. Although it’s beautiful and can create really unique spaces with old world items, the trend appears to be waning. In saying that, vintage accents will always be around to some extent, as people love to hold on to items with sentimental value. What’s sticking around – Interchangeable accents & Bold Graphics. I put these two in the same category, as over the past few years we’ve been seeing people grow in confidence with what they put in their home. Bold prints such a chevron, bold stripes or other graphics are being used to make a statement. Going hand-in-hand with that is the idea of changing a space as the seasons pass. I believe this is the main motivator for making people braver with their choices. It is not surprising that blue is the world’s (unofficial) favourite colour. Be it clear skies or tranquil water – blue is a colour that we see a lot of in nature, so it is natural that we are drawn to it in our homes. I chose this trend as the last in the series as I believe it is not just a trend. The colour blue comes and goes in popularity throughout the year (almost every year). However, we are starting to see colour more in homes as people are being courageous with their choices and hence, blue’s popularity is becoming more continuous. Virtually all these rooms below have beautiful neutral bases which have been dressed and accessorised in shades of blue that evoke a sense of calm. They are such simple touches, bringing life and personality to each of the rooms and are additions that can easily be interchanged (by editing cushions, rugs or artwork) as the seasons pass. A bevy of blues – just the name of it sounds cool and inviting…. Over the past couple of years we have been seeing a lot of black & white interiors that are sleek, modern & very sophisticated. While that trend doesn’t look like it will disappearing anytime soon, it is definitely evolving. A softness is being brought into this trend by using blacks that aren’t quite as solid, whites that are a little warmer and textures that bring in a sense of softness. The style is developing a heart and evolving into a style that is now chic, modern and well suited to not just the minimalist home. So what is the trick in creating a softer black and white scheme for your home? Incorporate with blonde timbers – This will warm up the colour scheme, without adding too much colour. Pale timber hues sit beautifully with fresh whites and prevent the look from being harsh or stark. Use Texture – Nothing softens a room like a variety of textures. To transform a space from sleek to chic in a very budget friendly and fast manner, use throws, cushions, rugs and other textural items such as woven baskets. Bring in Shades of Grey – Here you can be as lavish or modest as you choose. By simply adding a shade or two of grey a pure black and white room will be dramatically softened. This can also be achieved by using off-white instead of a crisp-white or charcoal instead of black. Here is a trend that designers around the world wish for year after year, and I think we are finally seeing it come into fruition. Saying goodbye to beige is all about incorporating more colour and other neutrals into your room. 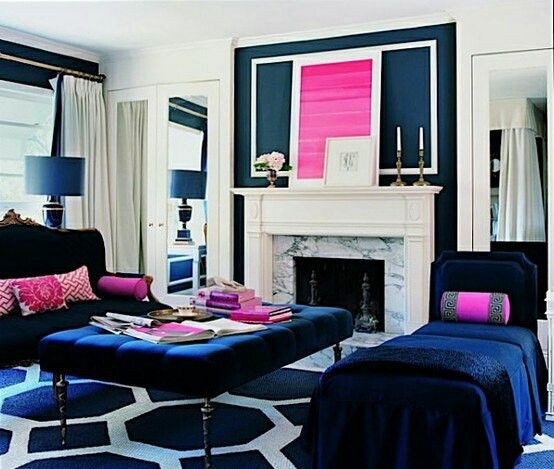 We are seeing this happen in a big way with greys, black and dark blues becoming more and more popular. Typical Beige or off white walls are being replaced with shades of grey, which really allow colours to stand out. Rooms boasting lots of natural light are being treated with deep shades of grey and black, creating mood, drama and contrast when teemed with bright whites. The over all look of opting for these “new neutrals” is very contemporary and just a little bit edgy. This week’s trend focus is Blossoming Prints, and by that I don’t mean the variety that you might find in your grandma’s lounge. Floral prints have come a long way over the yeas, and with modern technologies, we’re seeing some highly creative and bold ideas being implemented with this pretty trend. From simple prints or canvases to decorative sofas & rugs, the days of simply using a floral cushion or lamp shade have definitely passed! Lets take a look at some of the ways this trend is breaking the mould. Just like pairing a pretty dress with a leather jacket, mixing florals with bold modern stripes gives the look a more modern edge which is right on trend. The first study space would be very plain and somewhat uninviting with just the black and white throw, however the addition of the floral cushion – which then links back to the Peonies on the desk – gives this space a warm welcoming feel. Likewise, the next image with a bold navy stripe stops the space from becoming too fussy with the floral rug and cushions. Bold Rugs – I really believe using colourful and patterned rugs is one of the best ways to inject life and personality into a room without it being too in-your-face. The two floral rugs featured below give both spaces a unique feel thats feminine, inviting and exciting. One of the best tips I ever received, was to buy a rug you are absolutely without a doubt in love with, and use that as inspiration for the rest of your room. Just like the wise advise I once received, these rugs are acting as the inspiration of the colour palette used in the rest of their respective rooms. Oversized Art – If you have a large white space on your walls, using oversized floral prints is a beautiful way to bring colour and elegance into your space. This print below, reaching right to the floor, really sets the scene for the room. The space comes across as being very tasteful, yet still has a relaxed vibe with the use of an eclectic furniture collection. Use watercolour – Watercolour florals are bang on trend at the moment. Colours can become very vibrant yet still soft, which is the perfect complement in bedrooms for the young or the old. This bedroom below could definitely look like it belongs in a bedroom from generations past, however the use of varying scales and vivid colours completely modernises the space.